When the 2014 Chevrolet SS performance sedan hits the market later this year, it will carry a “base price” of $44,470 including the $995 destination fee but that price does not include the gas guzzler tax. While that sounds like quite a bit of money for a base model, we should point out the fact that the SS will only be available in one trimline that is loaded to the gills in very much the same form as the Corvette. This means that there is really no base model – just a top of the line package with a few optional upgrades for those who want a sunroof or a full seize spare tire. Standard features of the Chevrolet SS include things like an advanced infotainment system featuring Bose audio, heated and cooled leather front seats, HID headlights, LED daytime running lights, automatic park assist, dual zone climate control, a rear view camera and keyless entry with push button start. This base price also includes the buyer’s choice of five exterior colors - Mystic Green, Silver Ice Metallic, Red Hot 2, Phantom Black Metallic and Heron White while the interior of every unit with come in standard black. "The all-new SS is engineered for performance enthusiasts who've been clamoring for a rear-wheel-drive sedan," said Chris Perry, vice president of Chevrolet Marketing. "Adding the SS to the lineup further solidifies Chevrolet's position as America's best-selling performance-car brand and completes a trifecta that includes the all-new 2014 Corvette Stingray and Camaro Z/28." Most importantly, the starting price of the 2014 Chevrolet SS of $44,470 includes the 6.2L LS3 V8 that channels 415 horsepower and 415lb-ft of torque to the rear wheels via a 6-speed automatic transmission. A set of high performance Brembo stoppers provide world class stopping power while the lightweight 19 inch forged aluminum wheels that are wrapped in high performance Bridgestone rubber provide excellent acceleration, braking and handling capabilities. Thanks to the overall lightweight construction of this full sized performance sedan, a near 50/50 weight distribution should afford this sedan impressive handling capabilities while the low curb weight should help to make the most of the 415 available ponies. 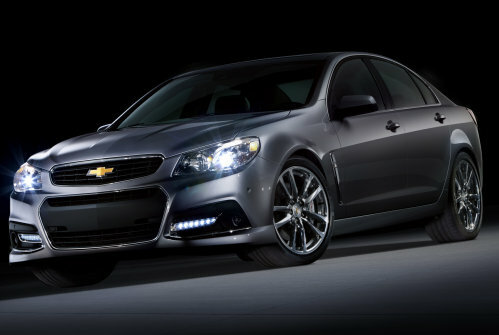 GM expects that the SS performance sedan will rip from a stop up to 60 miles per hour in right around 5 seconds. For those of you who might be questioning the suggestion that the 2014 Chevrolet SS performance sedan is a four door version of the Chevrolet Corvette, that unusual comparison comes straight from GM North American President Mark Reuss. While the SS is obviously a far cry from a Corvette with four doors, the new full sized sport sedan could prove to be real competition for the likes of the slightly less powerful Dodge Charger R/T and maybe even the more powerful Charger SRT8. The Charger SRT8 has spent a few years as the uncontested king of American performance sedans and with the 470 horsepower Hemi packed under the hood, the SS may have a hard time keeping up with “only” 415 horsepower. Fortunately, the 3,975lb weight of the new Chevy compared to the Charger’s 4,365lb weight should help quite a bit but in the long run – the SRT Charger still has an advantage in power to weight ratio (9.29lb/hp for the Charger, 9.58 for the SS) and that is a tough figure to overcome. On the other hand, the Charger SRT8 starts about $2,500 more than the SS so bargain shoppers may lean towards the new Chevy. Regardless of what is available from the competition, the 2014 Chevrolet SS performance sedan will finally give GM fans a chance to experience the same high performance four door fun that Mopar fans have been enjoying for the past few years.